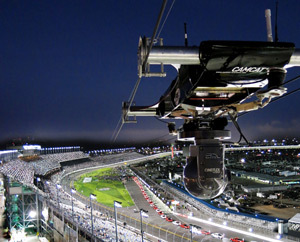 Developed in the nineties and continuously improved, the CAMCAT® System provides unique and stunning images from otherwise unobtainable perspectives, indoors and outdoors. Over the years its reliability and high quality have been proved on many occasions in sports, entertainment and documentary as one can learn from our references. The CAMCAT® System is a fully remote controlled cable camera system which achieves precise camera motion over distances up to 1000m at any conceivable angle and at speeds up to 130km/h with maximum stability and smoothness. Since the CAMCAT® System is based on a modular construction it can be adapted to a wide range of shooting situations. 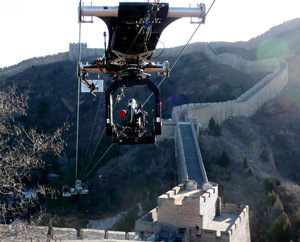 The camera buggy runs on two independent guide ropes made of heavy duty synthetic material and can accept a range of payloads from open platform stabilised mounts fitted with film cameras, to HD stabilised mounts with integrated camera and lens. The latest RF technology is utilised for picture transmission, camera and head control data to and from the camera buggy with an onboard battery providing seamless operation. The computerised remote controlled system is backed by an especially developed software that enables the two operating CAMCAT® technicians to pilot the CAMCAT® System either manually or in a preprogrammed automatic control mode. As safety is a top priority the CAMCAT® System complies with highest standards and is certified by German based TÜV Health and Safety Group, one of the strictest industrial safety authorities in the world. 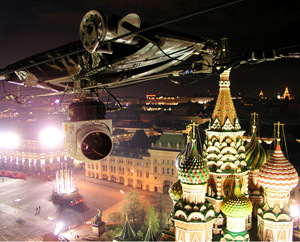 Images created by the CAMCAT® System have inspired the audience of film and TV around the globe demonstrating a unique spectacle on the screen.